The bodies of the wall, linking watchtowers, watch towers, and passes into a defensive line, are the main part of the Great Wall. Their heights differ depending on the local terrain. In flat areas and places of military importance, it is built quite high. While in the steep mountains and places of less important military meaning, it is built comparably lower to save financial and human resources. Generally speaking, the wall measures about 23 to 26 feet tall. The fracture surface of the wall is ladder type with the base measuring about 7.1 yards wide and the top measuring 6.3 yards wide on average, which makes it firm and very unlikely to collapse. The Great Wall of China was built using local materials and in a manner according to the technological level of the periods. Construction was mainly rammed-earth, bricks, and stone walls. Rammed-earth wall was the earliest method of wall construction. Before the Sui Dynasty (581 - 618), workers always adopted this way. They first filled a wooden mold with clay or plaster, then compressed it by pestle until it was hardened into shape, and finally laid them piece by piece to the satisfactory height and length. In desert terrain where suitable earth was not available, sand mixed with debris and willow branch was used as a replacement. This kind is much easier to build but also easy to be destroyed by enemies and susceptible to collapsing after long periods of time. Brick walls became popular during the Tang Dynasty (618 - 907) when the technique of brick production was fully developed. However, bricks were expensive at that time which limited its use in the construction of city gates and nearby walls. The outsides of walls were built by laying pieces of bricks while the inner walls were filled with yellow earth. Due to the increase of production levels of bricks in the Ming Dynasty (1368 - 1644), the cheap but high quality bricks were largely used. The wall was made strong enough to not only stop the intruders' steps, but also was able to resist attack from newly-invented firearms of the period. Of course, bricks must be agglutinated one by one to make the wall strong. During the Ming Dynasty, workers used lime mortar mixed with sticky rice juice as cementation materials which proved to be a very effective method. Stone walls were made of locally found stones when walls passed through mountainous areas. Some stones were processed into necessary stone pieces and others kept their original appearance. Between stones, mortar mixed with sticky rice juice was used to securely glue them together. The wall was firm enough to bear more weight, go through natural erosion and resist any weapon's attack of the period. Badaling was built in this way. There are many necessary designs attached to China Great Wall to make the defense system complete. Crenel: It refers to the parapets which are concave-convex shaped and often measures 6.6 feet high. They are used for watching enemies' activities and shooting at enemies while at the same time being sheltered. 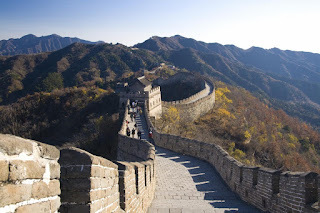 Parapet Wall: In Chinese, it is called Nuqiang or Yuqiang, literally translated as "Women's Wall", to indicate that it is low enough to allow a woman to climb over. It is built to ensure the safety of soldiers and horses on the wall, often 1.1 yards high and built on the inner side of the wall. Single Parapet Wall: As the name suggests, it is only a thin wall built on extremely steep mountain slopes. In this area, the regular way of building a double parapet wall is impossible to realize. The lofty peaks serve as natural barriers on the other side. The height varies according to the terrain, often measuring 6.6 to 11.5 feet tall. 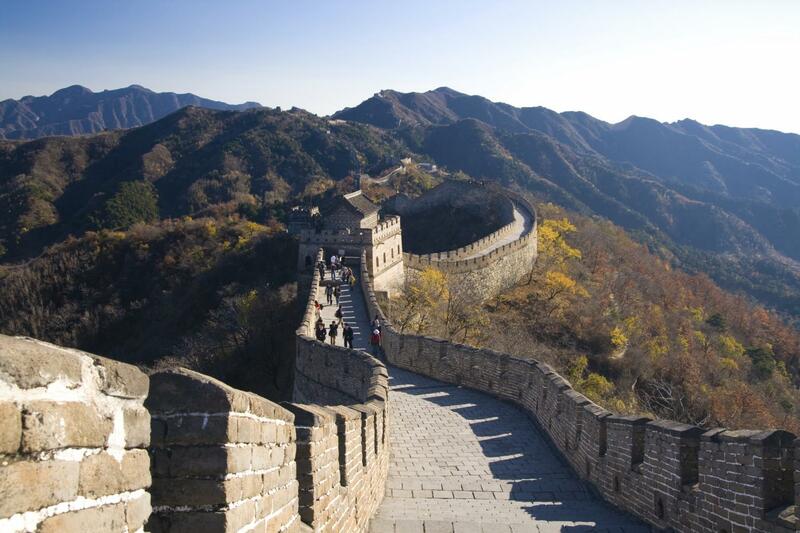 A famous and steep single parapet wall is located in Simatai. Barrier Wall: It is built vertically to the crenels. Once the enemies' attack approached the wall, allied soldiers could use barrier walls to provide cover for themselves. Horse Ramps (or Bridle Paths): Beside the gate tower usually laid a pathway which leads people and horses to the top of the wall. It measures about 5.5 to 6.6 yards wide. A parapet wall serving as railing was built on one side of it. The incline is 30 degrees and bricks were placed with their lateral surfaces skewed to provide anti-slip. Drainage System: In order to drain precipitation on the wall in a timely fashion, workers built barrel drains at certain intervals. Rain water could be drained to the outside through the mouth of the barrel drains which extended out from the wall about one yard. The drainage system has protected the wall from the erosion of rain water over a long period of time. Quanmen: On the inner side of the wall, at regular intervals, there are arched doors. When war was coming, soldiers could pass through these doors as indicators to the top of the wall to fight. Pufang: It is a shelter built on the wall or watchtower for soldiers on guard.